People trying to replicate their favorite items and gadgets from video games is nothing new, and with desktop 3D printing now at affordable prices, we’re seeing more of these types of projects than ever. At the risk of painting with too broad a stroke, most of these projects seem to revolve around weaponry; be it a mystic sword or a cobbled together plasma rifle, it seems most gamers want to hold the same piece of gear in the physical world that they do in the digital one. But [Jonathan Whalen] walks a different path. When provided with the power to manifest physical objects, he decided to recreate the iconic “Question Block” from the Mario franchise. But not content to just have a big yellow cube sitting idly on his desk, he decided to make it functional. While you probably shouldn’t smash your head into the thing, if you give it a good knock it will launch gold coins into the air. Unfortunately you have to provide the gold coins yourself, at least until we get that whole alchemy thing figured out. Printing the block itself is straightforward enough. It’s simply a 145 mm yellow cube, with indents on the side to accept the question mark printed in white and glued in. A neat enough piece of decoration perhaps, but not exactly a hack. The real magic is on the inside. 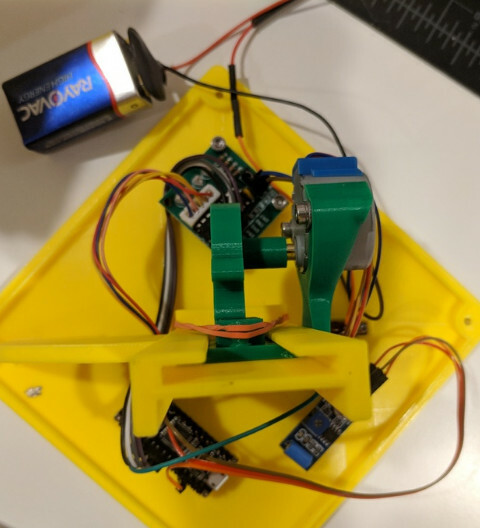 An Arduino Nano and a vibration sensor are used to detect when things start to get rough, which then sets the stepper motor into motion. Through an ingenious printed rack and pinion arrangement, a rubber band is pulled back and then released. When loaded with $1 US gold coins, all you need to do is jostle the cube around to cause a coin to shoot out of the top. If this project has got you interested in the world of 3D printed props from the world of entertainment, don’t worry, we’ve got you covered. Minecraft wizard, and record holder for the Super Mario World speedrun [SethBling] is experimenting with machine learning. He built a program that will get Mario through an entire level of Super Mario World – Donut Plains 1 – using neural networks and genetic algorithms. A neural network simply takes an input, in this case a small graphic representing the sprites in the game it’s playing, sends that input through a series of artificial neurons, and turns that into commands for the controller. It’s an exceedingly simple neural network – the network that can get Mario through an entire level is less than a dozen neurons – but with enough training, even simple networks can accomplish very complex tasks. To train the network, or weighting the connections between inputs, neurons, and outputs, [SethBling] is using an evolutionary algorithm. This algorithm first generates a few random neural networks, watches Mario’s progress across Donut Plains 1, and assigns a fitness value to each net. The best networks of each generation are combined, and the process continues for the next generation. It took 34 generations before MarI/O could finish the level without dying. A few members of the Internet’s peanut gallery have pointed to a paper/YouTube video by [Tom Murphy] that generalized a completely different technique to play a whole bunch of different NES games. While both [SethBling]’s and [Tom Murphy]’s algorithms use certain variables to determine its own success, [Tom Murphy]’s technique works nearly automatically; it will play about as well as the training data it is given. [SethBling]’s algorithm requires no training data – that’s the entire point of using a genetic algorithm.